It’s been a long-sought goal: a simple pill that diabetics can take instead of injecting insulin. Now, a team of researchers say they’re making progress toward that goal by developing a surprising solution: a pill with a needle inside that injects insulin into the stomach wall. It may sound scary, but the researchers say not to worry. They believe that, because the stomach wall has no pain receptors, it wouldn’t hurt. And the “needle” itself will dissolve, while the rest of the pill passes harmlessly through the body. The findings of a team from MIT, Brigham and Women’s Hospital, and Novo Nordisk were published Thursday in the journal Science. “We are really hopeful that this new type of capsule could someday help diabetic patients and perhaps anyone who requires therapies that can now only be given by injection or infusion,” MIT professor Robert Langer, one of the senior authors of the study, said in a statement. The problem with developing a pill for insulin and for many other drugs has been that the acids and bacteria in the gastrointestinal tract can break down drugs before they can get into people’s systems, researchers said. The new pill takes a physical approach, rather than a chemical approach, to solving the problem. About the size of a small blueberry, the new pill contains a tiny needle with a tip made of compressed, freeze-dried insulin that is injected into the stomach wall. The tip is the only sharp part of the device and is absorbed by the body. After the injection, the shaft of the needle degrades. And the remainder of the pill, which is made from polymer and stainless steel, passes harmlessly through the digestive system, the researchers said. “The device is designed to be small enough to pass through the body without issue,” first author Alex Abramson said in an e-mail. He noted that the US Food and Drug Administration has already approved several other pills that do not dissolve in the stomach and the new device has a smaller volume than those pills. The researchers said in the statement that they had tested the device, dubbed a “self-orienting millimeter-scale actuator,” in pigs and had been able to deliver 5 milligrams of insulin, which is comparable to a dose that a patient with Type 2 diabetes needs. People could take single pills or multiple pills. 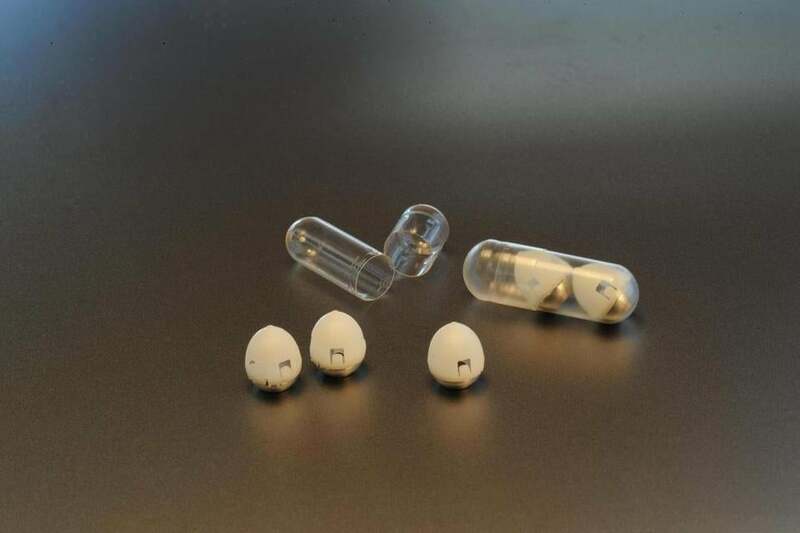 The researchers noted that they designed the pill with a special shape to ensure that it will fall and then orient itself at the bottom of the stomach so that the needle is facing toward the stomach lining rather than the stomach’s inside. The inspiration for the shape came from the leopard tortoise, found in Africa, and the shape was further refined by computer modeling. Research is continuing to further develop the pill. Outside experts said the device may well be a viable solution. “It’s a very new concept and a really cool idea,” said Edith Mathiowitz, a professor of medical science and engineering at Brown University. “What they have done is taken ideas from many areas and integrated them,” said Tejal Desai, chair of bioengineering and therapeutic sciences at the University of California San Francisco.